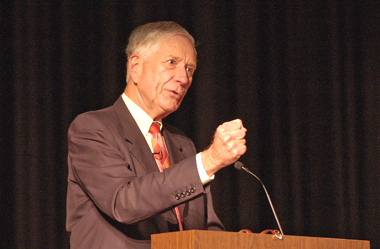 Astros owner Drayton McLane speaks at the CJ auditorium. Drayton McLane began his business career working the loading docks at his father’s grocery distribution company and rose through the ranks to eventually lead that company and run the baseball team that would win the National League Championship in 2005. But McLane wants to be sure his secret to success is no secret at all. The Houston Astros owner was at Sam Houston State University Monday morning as a part of the President’s Speaker Series. In addressing the students before him, McLane laid out his best advice on what it takes to be a good leader. First of all, he said, a leader must plan for the future. While it is easy to respond to what is happening at any given moment, the businesses who make it are the ones prepared for anything that may come ahead. In addition to planning ahead, McLane said a leader must inspire those in his company to work toward those long-term goals and challenges them to complete goals that, at first, seem impossible. A leader, he said, also has to have the drive and determination to lead those involved in his or her business to a better place. But McLane also said a leader must have a sense of humility. He drew from his own experience of coming home from Baylor University ready for a managerial position at his father’s company. What he found was the night shift on the loading dock. While his immediate expectations were quickly dashed away, McLane soon found out why his father made him climb the company ladder all the way from the bottom. Strong ambition, McLane said, must be partnered by strong values. McLane suggested writing down a value system to help make decisions on every business opportunity that comes along. While the majority of McLane’s speech focused on business advice, the question-and-answer portion focused solely on the Astros. When asked about the performance of Craig Biggio, McLane said the Astros’ second baseman exemplifies what it takes to be successful in life. “Craig played better last year than he had played in the last five or six years, and he is playing even better this year,” McLane said. “He wants to get to 3,000 hits, and very few people have ever achieved that. He’s about 200 short of that, and he can tell you about every hit he’s ever had. (With 3,000 hits), he’ll automatically go to the Hall of Fame. He’ll go to the Hall of Fame either way, but he wants to get 3,000 hits and if he continues at this pace, he should do it in the latter part of next year. Astros first baseman Jeff Bagwell has spent all of the 2006 season on the disabled list because of his right shoulder. When asked about a possible return for the first baseman, McLane said he still commands a great amount of respect from his teammates, but more procedures will need to happen before he returns to the field. “Jeff began to experience tremendous problems with his right shoulder,” McLane said. “He’s had two surgeries on it, and unfortunately, he still has difficulty with his shoulder. Most likely, he’s going to have to have more surgery, which could prevent him from coming back, so that’s a decision he needs to make in the next few weeks.